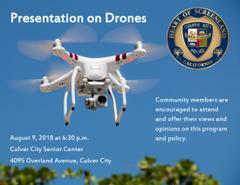 Community presentation on CCPD's Unmanned Aerial Vehicle Pilot Program (Drones). August 9th, 6:30pm "Senior Center" 4095 Overland Ave. The attached draft policy has been reviewed by the City Council, City Attorney's Office, outside legal counsel, and the CCPD Command Staff.